Remember the Volvo 262C? If not, check out the picture below. This was one weird looking car. Sometimes called the Bertone 262C, it was built by Bertone, but was actually designed for the most part by Volvo. Volvo thought that this is what we liked here in America. We didn't. Back in the 70s and 80s we liked our garish coupes to be American made. The Volvo 262C didn't sell well. But Volvo didn't give up. In 1986 they introduced the 780. This time Bertone not only built the car, they were responsible for much of its styling. Volvo wasn't looking for a sports coupe, they were looking for a classy GT type of look, and Bertone nailed it. They got interior right, too. It is a perfect blend of Swedish functionality and Italian luxury. The first 780s to hit our shores were a bit slow. Originally sold with the PRV V6 engine, this engine had some low end grunt, but ran out of breath as the RPMs got higher. In 1989 Volvo changed that by dropping a 175HP turbo engine into it. The car now had power to match its looks. In 1988 Volvo introduced a multilink independent rear suspension which gave the car better handling characteristics. Until recently, Volvos were known for running forever and needing very little maintenance. The 780s were no different, but, being a turbo, oil changes, cooling system flushes, routine things like that, need to be done on a very regular basis. Rust does not appear to be much of a problem with these cars, but check around the rear window and sunroof opening. Mechanical parts are easy to source as they are shared with other Volvos. Body parts and interior trim are another story as much of them are unique to the Coupe. Prices for the 780 have probably bottomed out, with good ones usually selling for less than 3K and low mileage mint ones for not much more. The 780 will never be a collector's item, but you can assume it will retain its current value for awhile and then creep up in value as the number of available cars diminishes. Buy it to drive it, not to make money off of it. 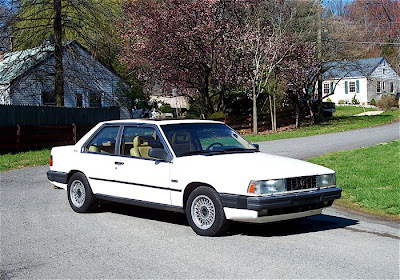 The 1989 Volvo 780 on eBay is being sold by a dealer who specializes in Volvos. It appears to be in very nice condition, showing some normal wear but no signs of neglect or abuse. Its low key style (made even "lower key" by being white) and Volvo nameplate won't turn many heads when you drive down the street, but you'll have a nice looking, exclusive, well engineered, fun to drive car that you won't need to spend a lot of money or time on to keep it running perfectly. There aren't many 20 year old cars you can say that about. Click here to see the eBay listing for this Volvo 780. For more info check out the Volvo 780 Information Site. An enthusiast site, it has a ton of info and some great pictures. It's easily the best 780 site around. VolvoAdventures.com has information on just about every Volvo and Volvo related car, including the 780. You can easily kill a few hours or more prowling around it. You know you're getting old when cars you remember as new cars are being talked about as classics! I wasn't impressed by the styling until I went to one of the links you provided and saw the car in a darker color. It really is a nice looking car. It almost looks like a Maserati Biturbo coupe. The color white does it no justice. I find it ironic that the 1979 Volvo 262c had a lowered roof and it was considered "ugly". Volvos are meant to have tall windows to match its tall sides and the lowered roof was deemed as ugly. I was 16 and fell in love with the car. Totally unique. Now the New Dodge products have lowered rooves and small side glass. Similar to the 1979 Volvo Bertone 262c. Dodge has always copied and tried to "out do" other car manufaturers in the 50-60 ie:tail fins that tended to fall apart even in the shows. I'm just saying.